At the club's AGM the club announced they are prepared to offer permanent staff £7.85 an hour, but will not implement the living wage to all. 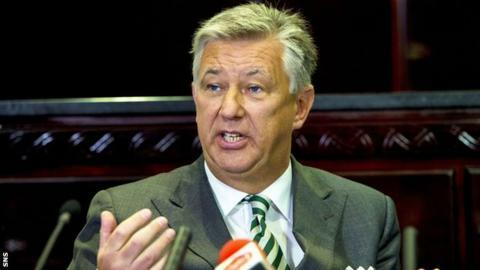 However, Lawwell feels Celtic have been unfairly targeted by others. "We've been used," he said. "Our club has been used over this campaign by politicians and by others." He added: "There's more and more evidence there's poverty in society, there is inequality, and we would urge them - the people who've got the power, who've got the opportunity to change it - to change it, and not hitch their wagon to Celtic's wagon for their own political purposes. "We're a football club. We'll do all we can in the community. We do so much, but we can't change government policy. "We have a very satisfied, highly motivated workforce who are content with their lot. Not just my words, but we're the only football club in Scotland that's got Investors in People [accreditation] and [there are] only three in the UK, so we look after our people." "I love Gordon dearly, he's a pal, but he's way off the mark there and we would never support that." Hearts last month became the first club to implement the living wage, but Lawwell insists their decision has had no bearing on Celtic. "Hearts are a different business," he said. "It's a small business in comparison, they won't have as many people. "If that's what they want to do, then good on them and they've done it. But we have to look after ourselves here and do the right thing. "At the moment we're looking at our permanent employees that includes everybody apart from match-day staff, who are primarily second income. "The 180 of them are mainly in retail, which is a very competitive business. Ironically our competitor is Sports Direct, and we're getting the spotlight." Celtic chairman Ian Bankier revealed the move to increase the wage for permanent staff will cost the club £350,000. Celtic have been put under pressure to introduce the living wage. He said: "We responded to the many people who have made approaches to us since this became a live issue and we understand what they're saying, and we understand the sentiment of what they're saying. "So what we've said today is we will speak to the people that matter in all of this, who are the employees. "We will talk to our permanent workforce, and those who are in that zone of pay policy, and we will seek to get their wages up to £7.85 an hour, which happens to be the rate of the living wage." Celtic also admitted at the AGM that the loss of Rangers from the Scottish Premiership has cost the club around £10m a year. However, responding to the recent comments by Scotland manager Gordon Strachan that the leagues should be manipulated to get their Old Firm rivals in the top flight along with Hibernian and Hearts, Lawwell was adamant there has been no discussion regarding league reconstruction. He said: "I love Gordon dearly, he's a pal, but he's way off the mark there and we would never support that."